For more than a week now, fans all over the world have been rewatching and picking apart every single frame of the first trailer for Star Wars: The Last Jedi. Since Disney and Lucasfilm had been very quiet on the details about the movie up to that point, there was an awful lot of excitement, but there has also been some concern that this movie will just be repeating the story beats of The Empire Strikes Back. Director Rian Johnson has put that theory to bed, albeit in a pretty snarky way. Rian Johnson is quite active on social media and, on a fairly regular basis, will engage with fans and even answer some question they may have. Recently. Someone on Twitter suggested that Star Wars 8 is just going to copy The Empire Strikes Back and said, "Nothing new here." Rian Johnson didn't seem to like that suggestion. Here is his response. "Greg is right actually, I've spent the last three years just copying Empire." Doing a little bit of reading between the lines there, it is clear that Rian Johnson, who both wrote and directed the movie, is being sarcastic and essentially shooting down that suggestion. That said, the concern that Star Wars: The Last Jedi will be a rehash of Star Wars: The Empire Strikes Back isn't totally unfounded. Cast members have made vague comparisons at least tonally, to both movies and there are definitely going to be some story beats that sync up. A Jedi in training, the possible surprising reveal of someone's parents, the bad guys going back on the offensive after suffering a huge defeat. So there could definitely be some similarities between the two movies. Not only that, but after seeing Star Wars: The Force Awakens, it is possible fans could be worried Star Wars: The Last Jedi will go the same route. 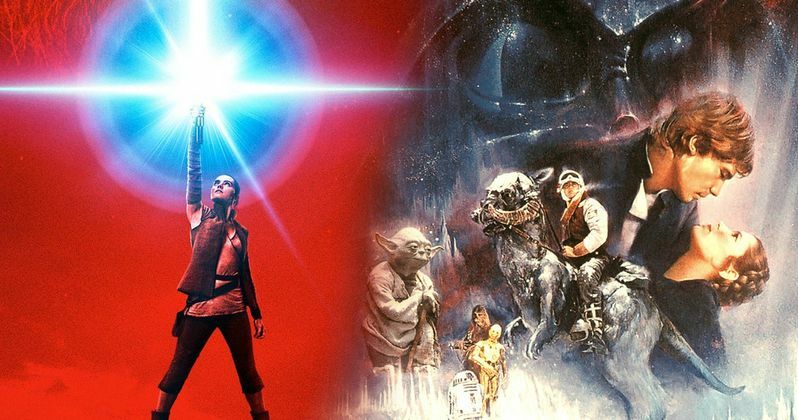 While The Force Awakens was very successful, both critically and at the box office, there were very obvious and numerous similarities between that movie and Star Wars: A New Hope. Some didn't like how much both movies mirrored one another and it is understandable that they may be worried that will happen again. But Rian Johnson is a very different filmmaker than J.J. Abrams and it seems like he didn't want to spend three years of his life retelling a story that has already been told. We'll have to wait until December to see just how similar both movies are, but even if they are more than a little similar, don't expect that to deter fans from seeing the movie when it is finally released. Star Wars 8 stars Mark Hamill, Daisy Ridley, John Boyega, Oscar Isaac, Lupita NyOng'o, Gwendoline Christie, Adam Driver, Benicio Del Toro, Laura Dern, Kelly Marie Tran and Carrie Fisher. Star Wars: The Last Jedi is set for release on December 15, 2017. @GregBurke85@Collider@Donimals_@KristianHarloff Greg is right actually, I've spent the last three years just copying Empire.